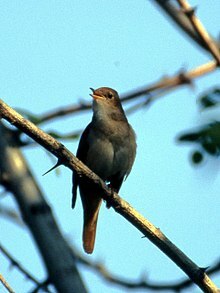 Nightingales (Luscinia megarhynchos), also known as rufous nightingale, is a small passerine bird best known for its powerful and beautiful song. It was formerly classed as a member of the thrush family Turdidae, but is now more generally considered to be an Old World flycatcher, Muscicapidae. It belongs to a group of more terrestrial species, often called chats. Hark from that moonlit cedar what a burst! Matthew Arnold, Philomela (1853), line 32. So poets live upon the living light. To their right praise, and true perfection! William Shakespeare, The Merchant of Venice (late 1590s), Act V, scene 1, line 104. William Shakespeare, Romeo and Juliet (1597), Act III, scene 5, line 1. James Thomson, The Seasons, Spring (1728), line 574.
por mirar al ruiseñor cómo cantavá. Sings his song of woe. Gil Vicente, "The Nightingale", as translated by John Bowring in Ancient Poetry and Romances of Spain (1824), p. 316. Quotes reported in Hoyt's New Cyclopedia Of Practical Quotations (1922), p. 557-59. I have heard the nightingale herself. King Agesilaus when asked to listen to a man imitate the nightingale. Plutarch, Life of Agesilaus. Lord Byron, Parisina, Stanza 1. Samuel Taylor Coleridge, The Nightingale, line 13. Samuel Taylor Coleridge, The Nightingale, line 43. Fair seasons, budding sprays, sweet-smelling flowers. William Drummond of Hawthornden, Sonnet, To a Nightingale. Sings the nightingale, the dear one. Heinrich Heine, Book of Songs, Donna Clara. To life the grass and violets sprang. Heinrich Heine, Book of Songs, New Spring, No. 9. John Keats, Ode, Bards of Passion and of Mirth. John Keats, To a Nightingale. Your transporting chords ring out. Minds us of our better choice. The nightingale is singing from the steep. What bird so sings, yet does so wail? And still her woes at midnight rise. John Lyly, The Songs of Birds. I woo, to hear thy even-song. John Milton, Il Penseroso (1631), line 61. John Milton, Sonnet, To the Nightingale. John Milton, Sonnet. To the Nightingale. When the earth grows pale and dumb." Dinah Craik, A Rhyme About Birds. And skies, with notes well tuned to her sad state. Petrarch, To Laura in Death, Sonnet XLIII. Christina G. Rossetti, Bird Raptures. Christina G. Rossetti, Twilight Calm, Stanza 7. Cease from thy enamoured tale. Percy Bysshe Shelley, Scenes from "Magico Prodigioso", Scene 3. Satiate the hungry dark with melody. Percy Bysshe Shelley, Woodman and the Nightingale. Sings out her woes, a thorn her song-book making. What grief her breast oppresseth. Sir Philip Sidney, O Philomela Fair. Warbles sweet her plaintive tale. Sophocles, Œdipus Coloneus. Translation by Thomas Francklin. Broken flowers and crushed grass. Walter von der Vogelweide, translation in The Minnesinger of Germany, Under the Linden. Last night, when all was still. From out the woodland hill. Christian Winther, Sehnsucht. Translation used by Marzials in his song, Last Night. This page was last edited on 2 March 2017, at 00:41.